“When you are anxious every feeling you wish never existed, happens. For me I get the queasy feeling like you are going to puke up your guts, the trouble breathing, throat closing, sweating, heart racing, hands and body shaking, and your mind thinking of everything that could possibly go wrong in that moment,” said Andrea, 20, a student at Stony Brook University. For Andrea and thousands of other college students across the nation and around the world, anxiety is an often times debilitating mental illness that affects their everyday lives. 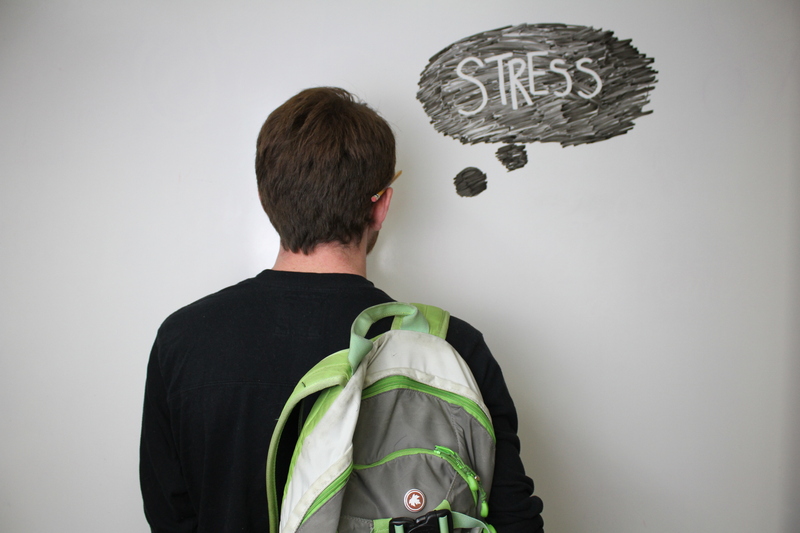 Although anxiety affects people from all age groups, it is becoming more and more prevalent among college-aged people. According to psychcentral.com, the average age of the onset of symptoms of mental illness occurs from the ages of 18-24 and 75 percent of people with an anxiety disorder will develop symptoms before the age of 22. College is a stressful time for many people: moving away from home, having to do everything by themselves and having to plan out the rest of their lives can be daunting and lead to anxious or panicked feeling. “I feel more and more college students are going through anxiety because this is the time that is basically going to impact the rest of our lives. We feel as though if we mess up now, our lives are going to be ruined. We feel we have to be perfect,” University of Tampa freshman Daniel, who did not want to have his last name mentioned due to the sensitivity of this subject, said. To understand anxiety and what people with it experience, one needs to know the different forms of anxiety. According to WebMD, the four main types of anxiety are: generalized anxiety disorder, panic disorder, social anxiety disorder, and specific phobias. Although all these forms of anxiety have similar symptoms, they are all unique in the triggers that bring them on. For Daniel, his social and generalized anxiety disorder is brought on by very specific triggers. One way to cope for many people is through therapy and counselling. Although it usually will not be as successful for people suffering with social anxiety due to the nature of talking to a stranger about one’s feelings, people with other disorders can benefit greatly. Talking through one’s fears, phobias and anxieties can allow you to understand what it is that is causing them and come up with ways to deal with them. Within therapy itself, there are different types of practices including psychotherapy and cognitive-behavioral therapy. Psychotherapy works by talking through the person’s problems, this type of therapy addresses the actual emotional responses to the anxiety itself to allow the patient to understand what they are feeling on a deeper level. Cognitive-behavioral therapy is similar but it helps teach the person how to change their behavior and patterns that often lead to the anxiety symptoms. If seeing an actual therapist is too daunting for you, talking through your feelings with trusted and understanding family or friends can help as well. Talking out loud to someone that you know will not judge you can allow you to understand and see what is causing you the anxious feelings as well as getting advice or help from your loved ones. This technique worked for college student and waitress Jamie from New York, who suffers from a phobia of being sick called emetaphobia. “I talk to my mom or sister because they have been with me throughout my journey, they are a sense of comfort for me,” Jamie said via text. Talking through your problems doesn’t work for everyone, as some people’s anxieties are caused by talking to other people. Like many other illness, mental illness is often treated with medications. Also like other illness, there is an array of medications and combinations one can take to help treat their anxiety. There are six groups of medications commonly used in the treatment of anxiety and panic disorders, including: antidepressants, tricyclic antidepressants, benzodiazepines, anticonvulsants, beta-blockers, and antipsychotics. All of these groupings work in different ways and target different symptoms of anxiety, according to healthyplace.com. –Antidepressants: Long term medication that targets the brain chemicals serotonin and norepinephrine which have an effect on moods. than regular antidepressants. These are more likely to cause side effects. –Benzodiazepines: Used to treat short-term anxiety and anxiety episodes. –Anticonvulsants: Not widely used but the anti-seizure medication is sometimes being used to treat some symptoms by controlling shakiness and convulsions. –Beta-blockers: Lower blood pressure and reduce some physical symptoms of anxiety. –Antipsychotics: Often used in a combination with other types of drugs due to the possibility of side-effects. Effexor XR (Antidepressant): used for panic and social anxiety disorder in adults. Constipation, nervousness, insomnia, decreased appetite, blurred vision, hypertension, weakness. Desipramine (Tricyclic Antidepressant): used for panic disorder. Chest pain, confusion, blurred vision, tingling feeling, racing heartbeat, nausea, loss of appetite. Lyrica (Anticonvulsant): being used to treat anxiety symptoms. Drowsiness, tremor, infection, weight gain, visual field loss. Xanax (Benzodiazepine): used for panic disorder and social phobias. Memory impairment, cognitive dysfunction, skin rash, fatigue. Propranolol (Beta-Blocker): used for panic disorder, stress disorder, and general anxiety. Difficulty breathing, stomach pain, bloody nose, euphoria, hair loss, fatigue, constipation. Risperidone (Antipsychotic): used for general anxiety. Agitation, dizziness, drowsiness, constipation, nausea. Phenelzine (Tricyclic Antidepressant): for panic disorders and social phobias. Chills, cold sweats, confusion, shakiness, swelling, overactive reflexes, sudden jerks of the body. Medication doesn’t work for everyone, and should only be taken when administered by a professional as many of these medications have serious side effects as well as a possibility of dependence and addiction. “Medicine never really helped me, if anything it made me more anxious. Going into things with a positive attitude and knowing you can control the outcome has helped me,” said University of Tampa freshman Kali Lang, who has been diagnosed with generalized anxiety disorder. Changing your diet and lifestyle can help get anxiety symptoms under control and more manageable. Calmclinic.com has said that reducing the intake of caffeine can reduce or lessen the severity of symptoms. Some foods recommended to aovid: coffee, tea, cola, energy drinks, and chocolate as these can raise your heart rate and blood pressure and combined with anxiety could cause both to be elevated too high. -Eat a breakfast that includes protein in order to keep your blood sugar steady. -Eat complex carbohydrates like pasta, beans and even oatmeal cookies to increase the amount of serotonin in the brain which will create a calming effect. -Eat healthy and balanced meals to increase both mental and physical health. At the University of Tampa, students have access to the campus wellness center which has many trained professionals who specialize in treating students with anxiety and panic disorders. The wellness center itself is open to any student through appointment where they can talk to a counsellor or a therapist about the symptoms they are experiencing. Along with individual counselling, the center offers programs to help multiple students cope with their problems. “Whether they come in with a diagnosis from another provider or have never been seen, it is best practice to perform a thorough clinical interview to determine symptoms and their impact on functioning,” Antonello said. “Once a person participates in a telephone screening with a clinician to determine the immediacy of their needs, they referred to a new patient appointment where the focus is information gathering in order for a clinical diagnosis and treatment recommendations can be made.” The wellness center’s main goal is understanding what the issue is that the student is facing and coming up with the best treatment plan, whether it be in their facilities or off campus. “In addition to individual counselling and medication, counselling services also offers a support group on Tuesday afternoons that specifically addresses issues with anxiety,” said University of Tampa social worker Yvonne Rodriguez. Along with counselling, Rodriguez recommended “The Anxiety and Phobia Workbook” by Dr. Edmund J. Bourne to help handle anxiety. Workbooks and processing her own feelings helped Kali Lang cope and get a better handle on her anxiety. “I read a lot, and went through a couple of therapists back home. My dad and I would do an anti-anxiety workbook and just work our way through it together, which helped. My dad was very supportive of me,” Lang said. This workbook gives the reader relaxation and breathing techniques, nutrition and exercise tips, as well as tools to end negative self-talk and beliefs. Treatments won’t always work for everyone, usually the most effective treatment plan is a combination of therapy, medication, and a healthy lifestyle. Listen to your mind and body, find what works for you and stick to it.